Ricky Freeman is a former officer in the United States Marine Corps and currently serves as the Vice President of Business Development and Sales, United States for Raytheon ELCAN Optical Technologies, a division of Raytheon Missile System, Tucson, AZ. Q: Since we last featured Raytheon ELCAN, there have been some new introductions to the ever-expanding Specter™ line of sights. Tell me a little about the SpecterTR™ 1-3-9x. What are the distinct advantages, and if its development and deployment was in response to an unmet need on the part of the warfighter, what was the niche that needed filling? A: The SpecterTR™ 1-3-9x represents the next and natural evolution of the very successful Specter™ family of day sighting systems. The SpecterDR™ Dual Field of View sights are currently fielded worldwide and have proven their capacity to maximize warfighter efficiency and lethality (Ph) in extremis. The battle-tested and patented concept of toggle-based, dual magnification sighting allows the shooter to rapidly acquire a target in both CQB and long range engagements with no need for focus adjustments and no boresight shift in either magnification. 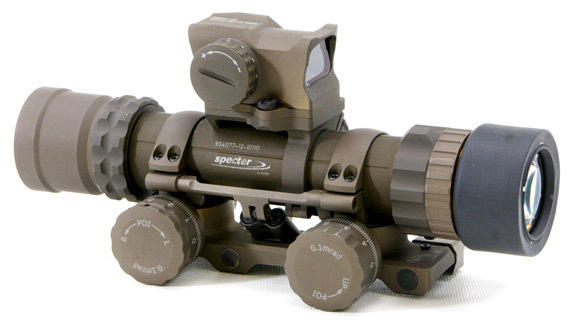 The SpecterTR™ 1-3-9x enhances the dual field-of-view capability by incorporating a mid-range magnification and offering a 3FOV (triple field-of-view) sighting system. Using similar, patented, toggle switching to that developed in the SpecterDR™, the SpecterTR™ incorporates a 1x red-dot CQB, a 3x mid-range and a 9x long range magnification into a single sighting system. The SpecterTR™ continues Raytheon ELCAN’s tradition of incorporating world-class optical performance and its trademark Ballistic Drop Compensation Reticle’s (BDCR) for 5.56mm and 7.62mm caliber weapon systems. With the inclusion of the mid-range 3x magnification, the SpecterTR™ 1-3-9x further enhances the shooter’s efficiency and lethality (Ph) in virtually every engagement scenario. Q: Also specifically designed for the CBQ environment, you have recently introduced a Continuous Optical Zoom Scope, the SpecterOZ™. Tell me a little bit more about this sight? I understand it is actually composed of two sub-systems? A: The SpecterOZ™ 5x-20x is Raytheon ELCAN’s first optical zoom sighting system and is the latest addition to the battle proven Specter™ line of military tactical weapon sights. The SpecterOZ™ sighting system is actually comprised of two subsystems: a ruggedized combat scope with a 5x-20x variable zoom magnification combined with an enclosed, top-mounted, 2MOA, red-dot, CQB sight. Each of the two subsystems can be used as stand-alone devices or integrated onto the host weapon system. 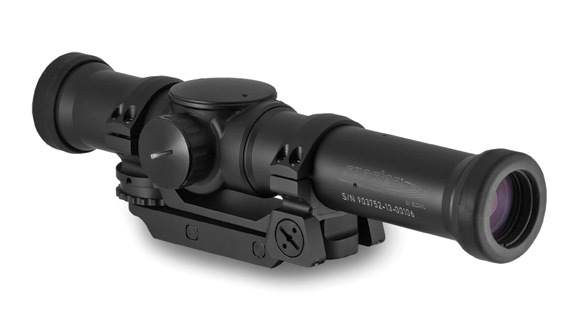 The SpecterOZ™ features greater than 3” (75mm) eye relief, adjustable CQB positioning (10:00, 12:00 and 2:00 position), user adjustable parallax settings, proprietary turret locking mechanism, a graduated grid reticle with etched rangefinder, a “click-zoom” magnification dial with tactile feedback for magnification changes and a reticle-based magnification indicator. The SpecterOZ™ scope offers a zoom range from 5x-20x for long range engagements while the SpecterMRDS™ Mini red-dot sight (MRD), a top-mounted, 2MOA CQB red-dot sight, addresses close-in engagements. All of this functionality is packed into an incredibly light weight and compact scope that is less than 9” in length and 38.6oz in weight. The unmatched length-to-magnification ratio of the SpecterOZ™ combat scope pushes the boundaries of optical performance for non-digital, day view sighting systems. Q: Are these two new members of the Specter™ sighting systems line currently available, have they been deployed, what kind of feedback are you getting from the field? A: Both the SpecterTR™ 1-3-9x Tri-FOV and SpecterOZ™ 5x-20x Optical Zoom have completed Technology Readiness Level (TRL) 8 System & Subsystem Development. Both systems have advanced to TRL 9 System Test, Launch and Operations and are now available for deployment. Initial production of the SpecterTR™ will commence in Q2 2014. The SpecterOZ™ is currently undergoing design modifications in advance of operational deployment planned to commence in Q3 2014. Operational systems are currently being fielded with international and US military units and their feedback will further inform the TRL 9 deployment phase. Q: I know there are few other things in development that I hope you are at liberty to discuss, specifically regarding Specter™ combat sights that will integrate with STORM or other geo-location & targeting systems. What can you tell me about that? A: Raytheon ELCAN believes that digital sighting technology is the future of day sighting systems. While we have no plans to abandon the Specter™ line of DVO sighting systems, we recognize the importance of developing capabilities that enable warfighters in today’s digital battle space. To that end, we are developing the next-generation Specter™ Digital sighting systems and while I am not at liberty to discuss the specific functionality of that system in this forum, in general it will offer the warfighter improved lethality (Ph) by integrating a digital display, laser-rangefinder, ballistic computer and automated targeting reticle into a compact, weapon-mounted sighting system. This new, multi-focal plane technology will merge the best practices and innovation of the vaunted Specter™ family of sights with the best available digital technology to create the next generation of Specter™ man-portable sighting systems. Q: Since the last time we spoke, have there been any significant contracts or procurements of Specter™ or other ELCAN products as part of any modernisation programmes that you can, or would like to discuss? A: The short answer is yes, we have received significant new awards for the Specter™ sighting systems that continue to solidify our global reputation for producing world-class sighting systems. However, in the interest of maintaining customer confidentiality we are unable to disclose the details of those procurements. Q: It seems that your gun sights, like all Raytheon products are constantly evolving to the changing needs of the modern warfighter and the combat environment. As you see it, and without revealing anything that might be proprietary of course, what is next for Raytheon ELCAN? A: As we look over the horizon at the future of man-portable sighting systems, we see macro-technologies becoming more accessible to the micro- technology environment. The modern battlefield is an asymmetrical environment where tactics are constantly changing. As such, the modern warfighter must have the tools and equipment that allow them to function in the dynamic battle space. It is this objective that drives Raytheon ELCAN in sighting systems innovation. Our focus is to become a technology provider that proactively develops the next-generation technology needs of the modern warfighter rather than reactively responding to those needs after they have been defined by others. The Specter™ sighting systems have successfully evolved in line with the needs of the modern battlefield because of our long-standing tradition of engaging the warfighters during technology development and allowing their feedback to inform the design and functionality of our systems. This collaboration has allowed Raytheon ELCAN the privilege of working with the finest military units in the world to develop relevant technologies that improve the warfighter’s lethality, efficiency and survivability in extremis.